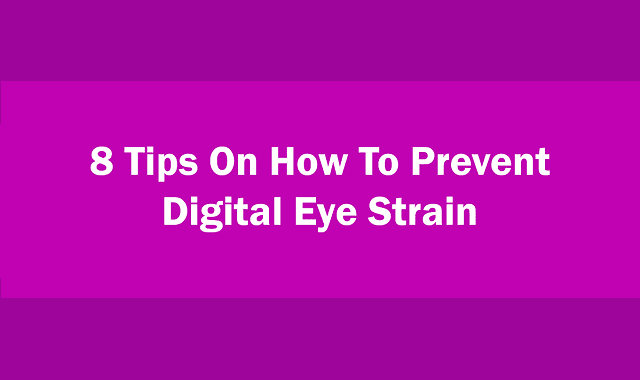 8 Tips On How To Prevent Digital Eye Strain #Infographic ~ Visualistan '+g+"
Have you ever had a headache or sore eyes after a long day at the office? There is 90% chance you have. These are only a few of the symptoms of digital eye strain. Others include blurred vision, pain in the neck, trouble focusing, sensitivity to light, and overall loss in productivity. Digital eye strain is related to the long hours we stare at the screens of various devices. Small, hard-to-read text on a smartphone torments your eyes. Uncomfortable workstation setup or bad lightning can also cause digital eye strain. But there are steps we can take to avoid the health issues and keep our eyes fit and healthly. In the age when information is addictive it is easy to forget to let your eyes rest. Frequent breaks from the screen can relieve you from headaches and neck pain, and can also boost your productivity. Simple eye exercises can prevent eye problems in the future. Adjustments to your workplace lightning will benefit you and your colleagues in the office. These and other tips on how to protect you eyes from the digital eye strain are summarized in the infographic below. With just a little bit of mindfulness you can avoid digital eye strain and enjoy your work day.